Winter has set in and the mountains are clothed with their winter coats. The birds are resting comfortably in their nests and the animals are hunkered down in their dens for warmth. 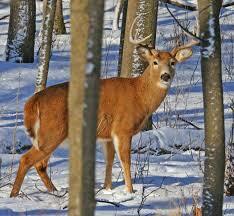 Deer roam the meadows in search for food with their winter coats thick. A slight wind blows across the mountains leaving an even deeper chill. Three hunters are bundled in their warm hunting clothes and slowly maneuver the deep snow. Their rifles are loaded and hopes are high for bagging at least one buck. They’ve seen the deer tracks and are following in silence when they spot a large buck. His thirteen point rack tells them he’s ripe for the kill. They aim their rifles but suddenly a doe and two small fawns appear out from behind a clump of trees. The family of deer is beautiful, even to the hunters. “We can’t shoot that buck.” One of the hunters whispers and lowers his gun. “It is a beautiful sight.” Another interjects, lowering his gun. They kneel in awe for several minutes watching the deer family graze. A fourth Man steps up beside them and slowly kneels in the snow. He says nothing while gazing at the deer. “Where did you come from?” One surprised hunter asks. A quiet chuckle is heard from the hunter. All is quiet as the hunters and the Man watch the deer graze. Suddenly a shot rings out across the snowy land and the deer jump and with lightning speed dart into the cover of the trees. The hunters jump to their feet searching the woods for whoever shot. The Man stands calmly as the hunters search. The solitude of the mountains has been breached. “That’s what we’re out here for!” One of the hunters sarcastically answers. “We weren’t going to kill the doe and fawn.” Another of the hunters replies. “Ah, but when the father is removed the entire family suffers, much like a shepherd with his flock of sheep,” The Man states. The hunter suddenly falls to his knees at the feet of the Man, as the other two stand gaping in amazement. Jesus is the Shepherd and we are His flock. When one becomes lost in the wiles of the world He will send His Holy Spirit to search out all who are lost. The Holy Spirit is the One who woo’s us toward accepting Christ as our Lord and Savior and without Him we would remain lost. There are those who will try to run and hide and use any excuse to not enter the family of God. Christ never gives up and it is our choice as to whether we will allow Him to pick us up out of the depravity of our worldly ways and unite us with Him. Well-written story. Thanks for sharing. Blessings. Thank you. I appreciate that and blessings to you.